We've reached the end of 2017! What better way to end off the year than with the aftermath of a shocking cliffhanger? Buffy the Vampire Slayer Season 2 Episode 14 shifted everything for our beloved Scoobies. This was when the series became darker and the era of Angelus started. As much as this sounds like a cliche, it was "must-see TV." In case you need a refresher, join me in rewatching "Innocence." When Angel lost his soul and he became Angelus, you couldn't have expected a more shocking twist. He went from brooding heartthrob to deadly psychopath in an instant. As a viewer back in 1998, I didn't expect him to turn evil. He was always Buffy's tortured beau on the side of good. What I loved about the pre-credits introduction was that it teased that something was amiss. The eerie song, Buffy waking up alone and Drusilla being overcome with visions built up the eventual twist. Editing foreshadowed Angel emerging as the vampire Angelus. And the moment of him killing the smoker and exhaling the smoke was the perfect touch. It's such a comedy gag, but it works. How has Joyce's staring of Buffy not been turned into a GIF/meme yet? It's the perfect example of mother's intuition. Let's face it: She could tell that something was up. She didn't know what it was, but she KNEW that Buffy did something. I was waiting for her to pry deeper and throw out a few more guesses. Joyce has a pretty good sense of intuition. Drusilla, Spike and Angelus reuniting was strangely heartwarming. It makes no sense why I feel this way, but I do. It's almost like seeing a comradery between them. All three of them naturally fit together once they realized Angelus was evil again. Before Buffy the Vampire Slayer Season 2 Episode 14, we only knew a bit of Angel's past with Spike and Drusilla. A few moments like when we found out how Drusilla was sired or the legend of Angelus. We never got a flashback of the four villains (including Darla) together before Angel's transformation. From this quick moment together, it's clear that they had A LOT of fun together. Spike: Don't just stand there, burn him! The Judge: This one cannot be burned. He's clean. The Judge: There's no humanity in him. Angelus: Couldn't have said it better myself. Angelus: Yeah, baby, I'm back. Permalink: There's no humanity in him. Who else felt really sad for Willow during "Innocence"? My heart broke for her. She had a major soap opera moment. It's one thing to catch your best friend making out with the person who used to pick on you; that's hard enough for an emotional standpoint. It is, on the other hand, worse to realize that the person you have a crush on would rather be with someone they detest than you. 'Emotionally crippling' doesn't quite cut it. Willow needed her space and Xander should've just let her go. As much as it's sad to see Willow this way, this was better for her in the long-run. Seeing Cordelia and Xander kiss helped her move on; it finally got her to give up her crush on her best friend. And, even though they are best friends, they worked much better as that than as potential lovers. Angelus treating Buffy badly when I was seven years old? It was sad to watch. Angelus treating Buffy badly and rewatching now in my twenties? He's a monster (and it's sad that I know men like him). He went right for the jugular to get at Buffy. He knew what would make her hurt the most and it had nothing to do with violence, it was all emotional abuse. It's a masterful plan to toy with the Slayer. Don't get me wrong, I hate everything he's doing, but from a character development standpoint, he's turning into the heartless villain that we need to be afraid of. Every word he uttered was essential to the story. No one should ever hear those words. I'm surprised Buffy didn't fight him right then and there...but she was heartbroken. Angelus: Lighten up, it was a good time. It doesn't mean like we have to make a big deal. Buffy: It is a big deal. Angelus: I should've known you wouldn't be able to handle it. Buffy: Angel! I love you. 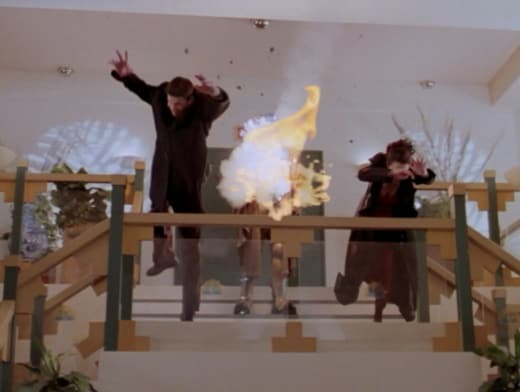 Jenny and her uncle should've told the Scoobies about Angel's trigger. This whole secrecy thing may have worked in the past, but it ruined everything in "Innocence." If they had only said something, Angel wouldn't have turned into Angeles. We learned the truth about the 'moment of true happiness' but it did nothing in hindsight. A simple warning would've prevented all this. Jenny bringing the cross to stop Angelus at Sunnydale High paled in comparison to what she could've done. Watching only goes so far until things go wrong. At least the Watchers train and help the Slayer before she goes into battle. Her inability to warn everyone nearly got Willow killed. Buffy: Did you know this was going to happen? Giles: You can’t just go around and accusing everybody! Jenny: I didn’t know...exactly. I was told...I was sent here to watch you. They told me to keep Angel and you apart, they never told me what would happen. Jenny: I’m sorry, Rupert. Angel was supposed to pay for what he did to my people. Jenny: I didn’t know what would happen until after. I swear I would’ve told you. Sarah: So it was me? I did it. Jenny: The curse. If Angel achieved true happiness, even if just a moment of...he would lose his soul. Giles: But how do you know you’re responsible for? Permalink: If Angel achieved true happiness, even if just a moment of...he would lose his soul. I loved that Buffy's premonition was what revealed Jenny's shadiness. The group never would've gotten an answer if it had not been for the dream. Sure, Buffy got too aggressive in the classroom and nearly hurt her with the choking, but she was angry. Think about a friend or someone part of your group who KNEW something bad was going to happen and did nothing. Buffy opened herself up to the person she loved and it caused chaos. Jenny knew that Buffy and Angel getting closer could cause problems with Angel potentially losing his soul. This was all information that needed to be said before Buffy took the next step on Buffy the Vampire Slayer Season 2 Episode 13. Here's the thing about the twist from Buffy the Vampire Slayer Season 2 Episode 6: If Xander can remember military experience, that means everyone else knows stuff about their costumes too, correct? Xander can't be the only one, it's not possible. With that logic, it means that Buffy knows about proper etiquette and courting, children with their demon knowledge, and a mess of other generic costumes people like to wear, like doctors and police officers. To make his plan of getting the weapon from the base, he still must know a lot about that past persona. By process of logic, the citizens of Sunnydale who bought the costumes must still have knowledge too. Willow: Forget it. I'm sorry. Well, do you? Oz: Sometimes when I'm sitting in class...you know, I'm not thinking about class, cause that would never happen. I think about kissing you. And it's like everything stops. It's like, it's like freeze frame. Willow kissage. Oh, I'm not gonna kiss you. Willow: What? But freeze frame. Oz: Well, to the casual observer, it would appear that you're trying to make your friend Xander jealous or even the score or something. And that's on the empty side. See, in my fantasy when I'm kissing you, you're kissing me. It's okay, I can wait. Permalink: Do you wanna make out with me? I have a lot of respect for Oz. He didn't settle for the romance he was given; he stood up for the romance he wanted. Willow was clearly using him to get over the fact Xander and Cordelia were together. Oz knew this and refused to be used. Claps for him! "Innocence" did something we don't usually see on Buffy the Vampire Slayer: The Scoobies had to fight the demon in public. We stepped away from the factories, the sewers, The Bronze, and other dark locations to be somewhere brighter. Random people were around and saw The Judge get blown to bits. That's something you don't ever forget, especially when the fire alarm sprinklers go off right afterward. I mentioned in the rewatch for Buffy the Vampire Slayer Season 2 Episode 13 that the concept of The Judge was underutilized. He was all flash and no substance in the actual battle of good vs. evil. His quick explosive death proved just that. 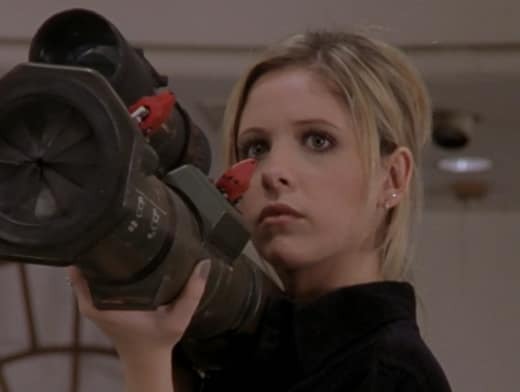 Seeing Buffy use a rocket launcher is definitely one of the highlights of the series. You can't get more dramatic than that, and Drusilla's reaction afterward was sheer perfection. I loved every minute of it. It's not surprising that Buffy couldn't kill Angelus in their first post-evil fight. Buffy the Vampire Slayer Season 2 had a lot more story to tell and by staking him, that would've ended any potential of saving him. Still, I'm glad she didn't do it. The fight in the sprinklers is iconic and we can't forget some of the horrendous things Angelus is going to do in the coming episodes. It's going to leave a big mark on all of the Scoobies. What did you think of "Innocence"? Should Buffy have staked Angel in the mall? Did Oz not kissing Willow make you like him more? Were the Scoobies too hard on Jenny?